FG MiniZ helps you paint your historical minis in the right colors with their new Prussian Army Uniformological Plates. 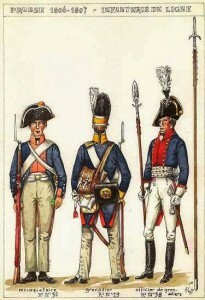 As promised here is a nearly unique painting guide for the 1806-1807 Prussian Army: Plates have been hand painted. It is rare to have so many reference in one document and I think it will help a lot of people looking for Prussian uniforms and flags.